Traditional Medicinals Smooth Move Tea is a wonderful blend of fennel, orange peel, cinnamon, coriander and ginger packaged into 16 individually wrapped tea bags. Advertências: Do not use laxative products when abdominal pain, nausea, or vomiting are present unless directed by a doctor. If you have noticed a sudden change in bowel habits that persists over a period of 2 weeks, consult a doctor before using a laxative. Laxative products should not be used for a period longer than 1 week unless directed by a doctor. Rectal bleeding or failure to have a bowel movement after use of a laxative may indicate a serious condition. Discontinue use and consult your doctor. Senna may produce abdominal pain, spasm or passage of liquid stools. Contraindications: Do not use if you have ileus, intestinal obstruction, stenosis, atonic bowel, acute intestinal inflammation (e.g. Crohn's disease, ulcerative colitis), appendicitis, abdominal pain of unknown origin, severe dehydration states with water and electrolyte depletion. Do not use if you have known allergies to plants of the parsley (Apiaceae) family, such as fennel. Keep out of reach of children. In case of overdose, get medical help or contact a Poison Control Center right away. Drink responsibly and follow all directions for use. 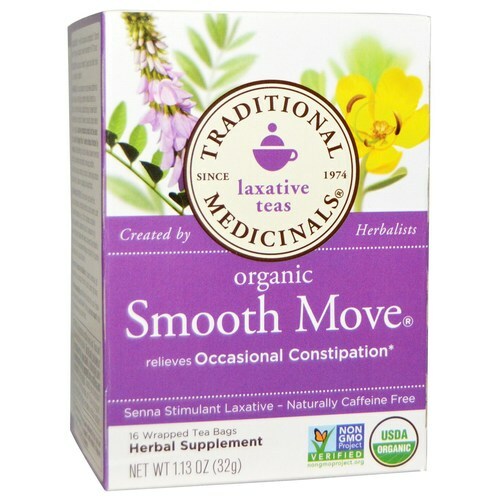 Please remember that Smooth Move products are not meant to be used for cleansing or as diet aids. Notice: This product contains senna leaf. Read and follow directions carefully. Do not use if you have or develop diarrhea, loose stools, or abdominal pain because senna leaf may worsen these conditions and be harmful to your health. Consult your physician if you have frequent diarrhea, or if you are pregnant, nursing, taking medication or have a medical condition. Notas: Non-GMO. Organic. Kosher. Caffeine free. Recomendações de uso: For maximum benefit, medicinal tea must be properly prepared. Pour 8 oz. freshly boiled water over a tea bag in a cup. Cover cup and steep 10-15 minutes. These steps directly influence the amount of beneficial components that will end up in your teacup! Gently squeeze the tea bag to release any remaining extract. Drink 1 cup at bedtime. 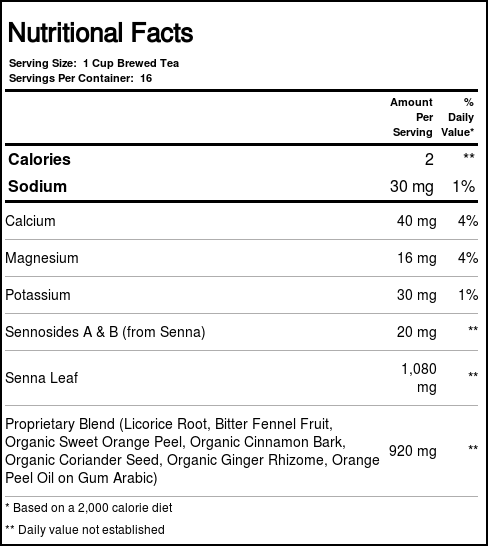 If necessary repeat the next day, not to exceed 4 cups in 24 hours. 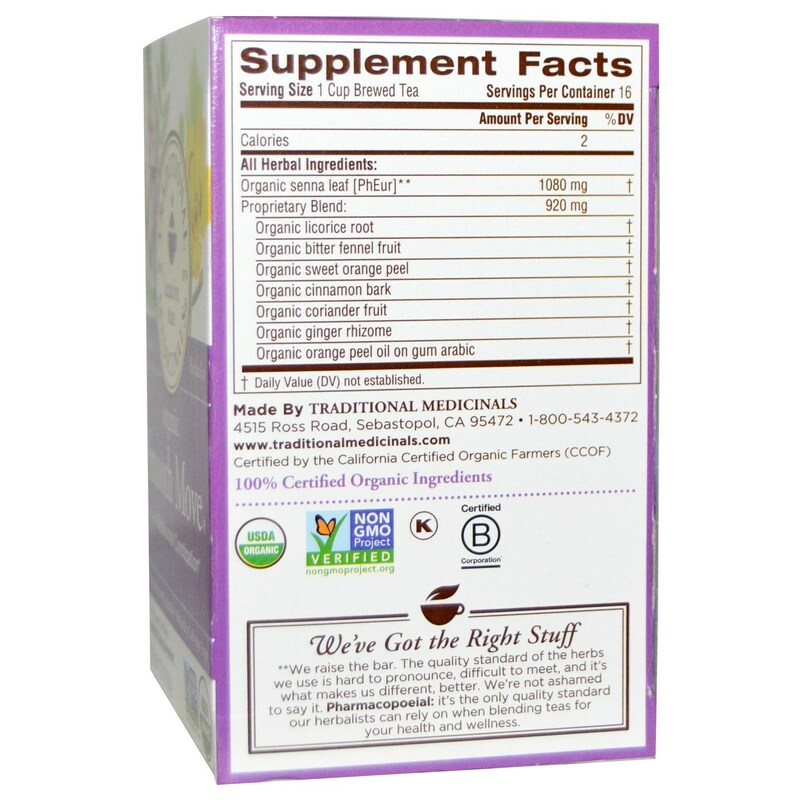 Children 6-12 years: Drink 1/2 cup at bedtime. If necessary, repeat the next day not to exceed 2 cups in 24 hours. As avaliações dos clientes postadas abaixo são baseadas em experiências individuais e NÃO representam necessariamente os resultados esperados ao usar/tomar Traditional Medicinals Suave movimento Chá 16 Sacos. Esses resultados podem ser atípicos e você não deve necessariamente esperar ter os mesmos resultados. Os resultados reais podem variar.